We’re putting out the mailbox on our latest project, a custom home in Burr Ridge, Illinois. While we often think of modern contemporary homes as minimalist – usually all white and with an exploration of space and volume – what’s more notable about this one are the rich textures and colors because of the materials, lighting and even sound considerations. The natural and reclaimed materials on the interior and exterior suit the clients’ tastes and create unique transitions between rooms. To start, the exterior showcases Chicago’s characteristic reclaimed brick, fired 100 years ago and repurposed from the original building. The house expresses texture and a range of color, as well as interesting use of vertical and horizontal orientations. Around the side, harvested poplar bark from Spruce Pine, North Carolina (Barkhouse.com) went into the making of the shakes. Because of lichen and other natural growth on the trees, each shake also showcases a progression of textures and colors. When exposed to rain, the appearance alters. This is a special effect brought to the home by a living, natural material. Natural and reclaimed materials on the interior and exterior offer a ‘distressed’ style, also out-of-the-ordinary for a modern home. Yet we introduced other, more refined materials for a uniform appearance. While the clients and their neighbors notice these aesthetics, the roof’s details remain unseen. Most of the roof is flat with some angling at the standing metal seams. The entire exterior showcases interesting contrasts – lots of linear patterns among the brick, metal and even the shakes. 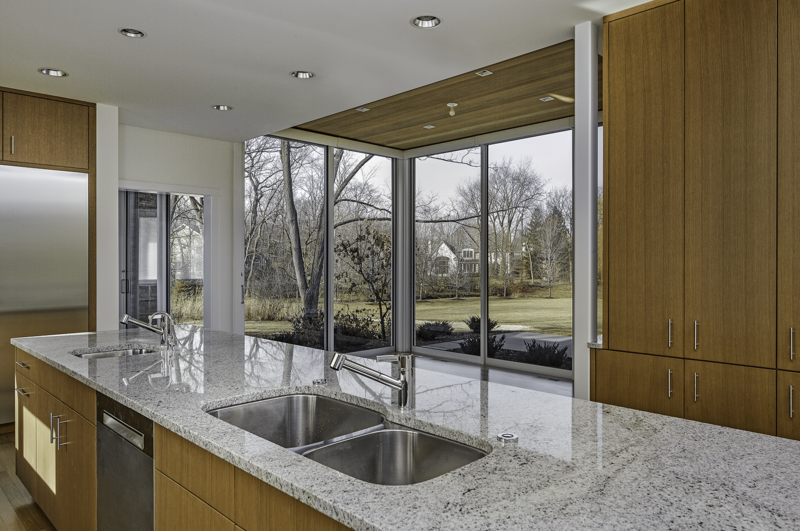 Lastly, big panels of sliding glass walls welcome natural light indoors. Sunlight plays a major role in the client’s living experience. And, just as the materials offer a study in contrasts, so, too, the two people who live there express themselves as individuals in unique ways. Natural and reclaimed materials on the interior and exterior play a role in adding warmth and character to what would typically be a cold expression of space. One of the clients is a retired professional from an IT company; the other is a nuclear physicist who plays french horn in a brass quintet. In the major space that would otherwise be a great room, we’ve created a music room. It is the heart of the home. An extraordinarily unique space, it has few, if any, right angles.